When replying to received emails, your signature is sometimes added in an incorrect manner. You want to know why this happens and how you can resolve this problem. Even if you have set HTML format as the default format in the options, it is not always used. 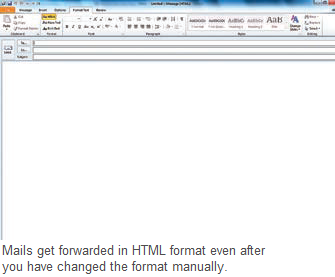 This is because when replying to and forwarding mails, Outlook by default uses the format of the received email. In case of a “Plain Text” email format, only text is reformatted along with your signature. When replying to a Plain Text email, retain the same format since the recipient might not be able to read HTML messages. You can, however, format it as HTML when forwarding. You always need to adapt the setting in such a case. For this, go to the dialog box for composing an email and then in the “Format Text” tab or the “Options” tab in Outlook 2007 and change the setting in “Format” to “HTML”.